What a difference a year makes! Or does it? 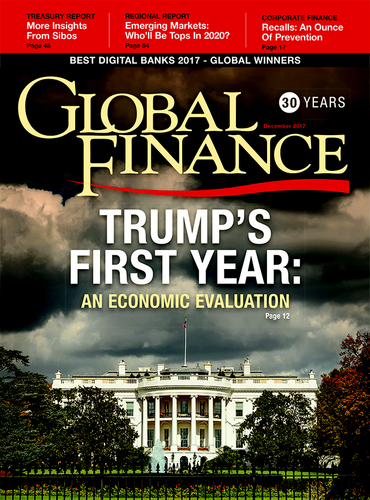 One year after the victory of Donald Trump, not much of his legislative agenda has been accomplished, as our cover story shows. Much remains up in the air. Nevertheless, 2017 turned out to be a better year than expected on the economic front for many regions and countries of the world. Tax reform is still being debated in the US Senate and the version under consideration there is very different from the one already approved by the House. If a final bill is approved, it would represent a major achievement for the Trump administration, which has not accomplished many of the goals the candidate laid out during the campaign. On trade, for example, although the US pulled out of the TPP treaty as promised, it has been stymied in Nafta renegotiations. Going forward, key appointments to the Federal Reserve and the Supreme Court will certainly impact future US policies—the court for decades to come. Geopolitical risks are clearly not missing. On the economic side the “normalization” of interest rates by the Fed (and eventually the ECB and the Bank of Japan) is still a step into a new territory—as was quantitative easing when it was announced. The economists of the Conference Board in New York are forecasting increased growth in the US in 2018 compared to this year, but not in other mature economies. While in all mature economies, growth should be relatively stable at around 2.2%, in emerging markets their forecast calls for a growth of 4% as in 2017. China should experience a small slowdown from 4.2% to 3.9% and India an improvement from 6.2% to 6.5%, and growth should improve in Latin America, Mideast and Africa. Nothwithstanding these uncertainties, the year that is coming to an end has surprised many for the economic growth registered in most countries, and for the low level of inflation. That’s a good surprise heading into 2018.